The Guajillo chile is one of the most commonly used Mexican dried chiles, and it is now widely available in the United States. It is long and pointy, with a beautiful maroon color. Its skin is quite smooth and shinny on the outside, but it is hard and tougher and less pliable than others, like the Ancho. It has a pleasant and deep flavor, with mild heat. It tends to be a crowd pleaser. In the north of Mexico, it is called Rattle chile or Cascabel because it resembles the tail of a rattlesnake and it makes the sound of a rattle as you shake it. 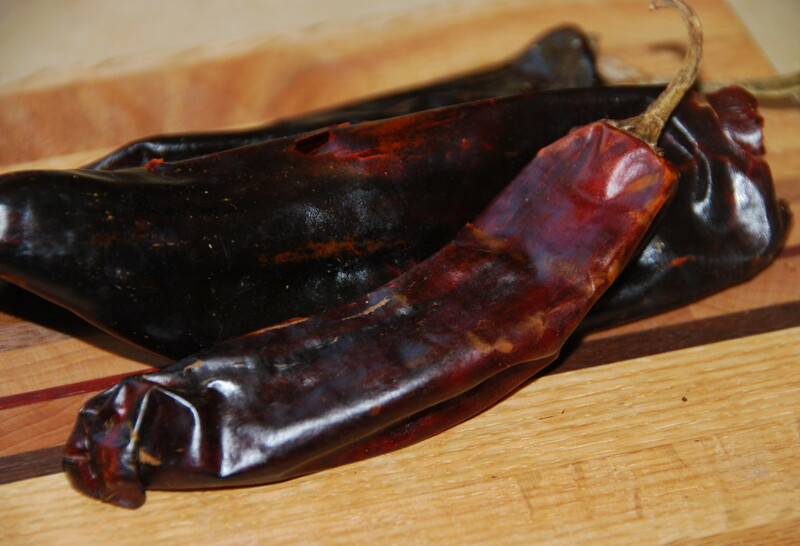 But, there is another chile of an entirely different variety that goes by the name Cascabel. It is used in many ways, such as to prepare table sauces, to season stews, moles and soups, to make adobos and rubs too. Usually, to use the chile, you need to remove the stem, seeds and veins. Toast the chile in a comal or skillet for about 10 to 15 seconds per side, until it turns brownish and opaque. Just be careful not to burn it or it will taste bitter. Then in most cases, it is either ground or simmered and pureed or mashed along with other ingredients. Oh here’s my Guajillo Chile Salsa recipe, Jimmy: https://patijinich.com/recipe/guajillo-chile-salsa/ Enjoy. Dear Pati, I love your show and I am about to try my first ever Mexican dish. Your “carmalized pasilla brisket”. My problem is trying to find the pasilla chilies. A friend of mine gave me some Chilaca chilies, can I use them instead? Thank you for tuning in, Marilyn! For the brisket, the Pasilla chiles really do give a distinct flavor. You can find pasilla chiles online, if you can’t find them in a store. Have fun in the kitchen! Love the show (how can you not). I saved one of your chili recipes that you used a guajillo chili sauce that was so complex with organic unsweetened cacao powder and cinnamon. The recipe was part of an interview you did with a blog in DC. I saved it as a favorite, as it clearly was the best chili recipe I have ever had. now the link is dead and so is my heart, as my attempts to replicate from memory have failed miserably. Please help! I made your nopalitos with corn, guajillos, etc. The nopalitos are kind of papery (like onion skin). The recipe does not say to rehydrate. Suggestions? Mil gracias! Hmmm…the quality or age of the nopales could be the problem. Were they fresh and tender? You shouldn’t have to rehydrate them or the guajillos, as they should all rehydrate in the pan with the lime juice and oil as you cook. I am preparing pork tamales, can I use guajillo peppers instead of ancho peppers?? If I use to much cumin how can I correct the taste. Does cumin taste bitter if I use to much. I just watched your show – Girls Just Wanna Have Fun and you make what I thought was an Ancho Chile Relish. You said it is a staple that you keep in your icebox every day … in a ball jar! I have looked all over for the recipe – could you help me? What is a good recipe for enchiladas rojas using chilies gaullio? Hi Pati, in the event of accidently making a bitter sauce with the chiles. What is the best technique to try to doctor the sauce or at least lessen the bitterness? I almost always do this. Thanks for showing us these great recipes. Pati, do you still toast the guajillo when it is already dried? If not, how do you usually deal with the dried chile? Hi Molly, Yes! You toast the dried guajillo chile. Just be very careful not to burn because it will taste bitter. Can the cascabel taste good in chicken tamales instead of ancho? I plan to use it in the chicken meat. Hola Rosalidia, Yes! The cascabel would work well in the chicken tamales. Go for it!! Would these be a suitable replacement for ancho chile in your chilorio recipe? In terms of flavor and heat?